An electric current flows in a wire from north to south. What will be the direction of the magnetic field due to this wire at a point (a) east of the wire, (b) west of the wire, (c) vertically above the wire and (d) vertically below the wire? According to the right-hand thumb rule, if the thumb of our right hand points in the direction of the current flowing, then the curling of the fingers will show the direction of the magnetic field developed due to it and vice versa. Let us consider the case where an electric current flows north to south in a wire. The magnetic field due to a long straight wire has been derived in terms of µ, i and d. Express this in terms of ε0, c, i and d.
You are facing a circular wire carrying an electric current. The current is clockwise as seen by you. Is the field at the centre coming towards you or going away from you? According to the right-hand thumb rule, if we curl the fingers of our right hand in the direction of the current flowing, then the thumb will point in the direction of the magnetic field developed due to it and vice versa. Therefore, in this case, the field at the centre is going away from us. ∮B→·dl→=μ0i,the current outside the curve is not included on the right hand side. Does it mean that the magnetic field B calculated by using Ampere’s law, gives the contribution of only the currents crossing the area bounded by the curve? ∮B→.dl → = μoi, i is the total current crossing the area bounded by the closed curve. The magnetic field B on the left-hand side is the resultant field due to all existing currents. The magnetic field inside a tightly wound, long solenoid is B = µ0 ni. It suggests that the field does not depend on the total length of the solenoid, and hence if we add more loops at the ends of a solenoid the field should not increase. Explain qualitatively why the extra-added loops do not have a considerable effect on the field inside the solenoid. The magnetic field due to a long solenoid is given as B = µ0ni, where n is the number of loops per unit length. So, if we add more loops at the ends of the solenoid, there will be an increase in the number of loops and an increase in the length, due to which the ratio n will remain unvaried, thereby leading to not a considerable effect on the field inside the solenoid. A long, straight wire carries a current. Is Ampere’s law valid for a loop that does not enclose the wire, or that encloses the wire but is not circular? A straight wire carrying an electric current is placed along the axis of a uniformly charged ring. Will there be a magnetic force on the wire if the ring starts rotating about the wire? If yes, in which direction? (l→×B→)=0⇒F→=0Therefore, no magnetic force will act on the wire. Two wires carrying equal currents i each, are placed perpendicular to each other, just avoiding a contact. If one wire is held fixed and the other is free to move under magnetic forces, what kind of motion will result? F→=i. (l→×B→), â€‹where l is the length of the wire and B is the magnetic field acting on it. Suppose we have one wire in the horizontal direction (fixed) and other wire in the vertical direction (free to move). If the horizontal wire is carrying current from right to left is held fixed perpendicular to the vertical wire, which is free to move, the upper portion of the free wire will tend to move in the left direction and the lower portion of the wire will tend to move in the right direction, according to Fleming’s left hand rule, as the magnetic field acting on the wire due to the fixed wire will point into the plane of paper above the wire and come out of the paper below the horizontal wire and the current will flow in upward direction in the free wire. Thus, the free wire will tend to become parallel to the fixed wire so as to experience maximum attractive force. Two proton beams going in the same direction repel each other whereas two wires carrying currents in the same direction attract each other. Explain. Two proton beams going in the same direction repel each other, as they are like charges and we know that like charges repel each other. When a charge is in motion then a magnetic field is associated with it. Two wires carrying currents in the same direction produce their fields (acting on each other) in opposite directions so the resulting magnetic force acting on them is attractive. Due to the magnetic force, these two wires attract each other. But when a charge is at rest then only an electric field is associated with it and no magnetic fiels is produced by it. So at rest, it repels a like charge by exerting a electric force on it. Charge in motion can produce both electric field and magnetic field. The attractive force between two current carrying wires is due to the magnetic field and repulsive force is due to the electric field. In order to have a current in a long wire, it should be connected to a battery or some such device. Can we obtain the magnetic due to a straight, long wire by using Ampere’s law without mentioning this other part of the circuit? We can obtain a magnetic field due to a straight, long wire using Ampere’s law by mentioning the current flowing in the wire, without emphasising on the source of the current in the wire. To apply Ampere’s circuital law, we need to have a constant current flowing in the wire, irrespective of its source. Quite often, connecting wires carrying currents in opposite directions are twisted together in using electrical appliances. Explain how it avoids unwanted magnetic fields. Connecting wires carrying currents in opposite directions are twisted together in using electrical appliances.If the wire is twisted, then the resultant fields from consecutive twists are in opposite directions. So the cumulative effect over a long length of wire is roughly zero. Let at any point in between the two wires, B1 and B2 be the magnetic field due to wire 1 and wire 2 respectively. From the diagram, we can see that the net magnetic field due to first turn is into the paper and due to second twisted turn is out of the plane of paper so these fields will cancel each other. Hence if the wire is twisted, then the resultant fields from consecutive twists are in opposite directions. So the cumulative effect over a long length of wire is roughly zero. Two current-carrying wires may attract each other. In absence of other forces, the wires will moves towards each other increasing the kinetic energy. Does it contradict the fact that the magnetic force cannot do any work and hence cannot increase the kinetic energy? Magnetic field can not do any work and hence can never speed up or down a particle. Consider 2 wires carrying current in upward direction. Magnetic field due to current in wire 1 produces a magnetic field out of the plane of paper at the position of wire 2. Due to this magnetic field, a force is exerted on wire 2. Wire 2 electron, moving in downward direction, move in circular paths due to this magnetic force. As these electrons can not come out of the wire so while describing circular path,they hit the edges of the wire and tranfer a momentum to the wire. Due to this change in momentum, wire starts moving and gains kinetic energy. A vertical wire is carrying current in upward direction, so the magnetic field produced will be anticlockwise (according to the right-hand thumb rule). As the electron beam is sent horizontally towards the wire, the direction of the current will be horizontally away from the wire (direction of conventional current is opposite to the direction of the negative charge). According to Fleming’s left-hand rule, the force will act in upward direction, deflecting the beam in the same direction. (d) will exert a force on the circular loop parallel to itself. (l→×B→)=0⇒F→=0Thus, the straight wire will not exert any force on the loop. A proton beam is going from north to south, so the direction of the current due to the beam will also be from north to south. Also, an electron beam is going from south to north, so the direction of the current due to the beam will also be from north to south. The direction of conventional current is along the direction of the flow of the positive charge and opposite to the flow of the negative charge. The magnetic field generated due to them will enter the plane of paper in the west and come out of the plane of paper in the east, according to the right-hand thumb rule. Since both the beams have currents in the same direction, they will apply equal and opposite forces on each other and, hence, will attract each other. Thus, the electron beam will be deflected towards the proton beam. According to the right-hand thumb rule, if we curl the fingers of our right hand in the direction of the current flowing, then the stretching of the thumb will show the direction of the magnetic field developed due to it and vice versa. Let north-south is along x axis and east-west is along y axis. Circular wire is in xz plane. Then point A will lie on positive y axis and B on negative y axis. On looking from point B, current is flowing in anticlockwise direction so the magnetic field will point from right to left. Hence, the magnetic field due to the loop will be towards west at both A and B. (d) rotate about the wire. FAB = μoi1i22πd (Towards the wire)FCD = μoi1i22π(d+a) (Away from the wire)Here, FAB > FCD because force is inversly proportional to the distance from the wire and wire AB is closer to the wire carrying current i1. The forces per unit length acting on sides BC and DA will be equal and opposite, as they are equally away from the wire carrying current i1, with current i2 flowing in the opposite direction. Therefore, the loop will move towards the wire. F→=q(v→×B→)As the charge is moving along the magnetic line of force, the velocity and magnetic field vectors will point in the same direction, making a cross product. (v→×B→) = 0⇒F→ = 0So, the magnetic force on the particle will be zero. Because of the presence of a charge, a particle produces an electric field. Also, because of its motion, that is, the flow of charge or current, there is generation of a magnetic field. When a particle of mass m carrying charge q is projected with speed v in a plane perpendicular to a uniform magnetic field B, the field tends to deflect the particle in a circular path of radius r.
E = 12mv2Therefore, the area bounded is proportional to the kinetic energy. R1 = m1v1qBR2 = m2v2qBSince both the particles are accelerated through the same potential difference, both will have the same kinetic energy. (d) perpendicular to the plane of the currents. â€‹According to Fleming’s left-hand rule, if the forefinger and middle finger of our left hand point towards the magnetic field acting on a wire and the current flowing in the wire, respectively, then the thumb will point towards the direction in which the force will act (keeping all three perpendicular). Direction of force can be determined using Fleming’s left-hand rule. In the figure, dotted circle shows the magnetic filed lines due to both the wires. Magnetic field at any point on the middle wire will be acting along the tangent to the masgnetic field lines at that point. Therefore, the wire will experience a magnetic field pointing â€‹towards the 40 A wire. Due to AB, the force will be towards right and due to CD, the force on the wire will be towards right. So, both the forces will add to give a resultant force, which will be towards right, that is, towards the 40 A current-carrying wire. B = μoi2πaWhen both the wires carry currents i1 and i2 â€‹in the same direction, they produce magnetic fields in opposite directions at any point in between the wires. B’ = μoi12πa-μoi22πa = 10 μT ..(1)Here, a is the distance of the midpoint from both the wires. When both the wires carry currents in opposite directions, they produce fields in the same direction at the midpoint of the two wires. z=lCR. Here, l is the length of a wire, C is a capacitance and R is a resistance. All other symbols have standard meanings. (a) x, y have the same dimensions. (b) y, z have the same dimensions. (c) z, x have the same dimensions. (d) None of the three pairs have the same dimensions. ⇒z = lRC ⇒ [z] = [LT-1]Therefore, x, y and z have the same dimensions. (d) the field at one point is opposite to that at the other point. Consider a current carrying wire lying along x axis. At any two points on z axis which are at equal distance from the wire,one above the wire and one below the wire,the magnitude of magnetic field will be same and their directions will be opposite to each other. At any two points on z axis which are at different distances from the wire,one above the wire and other also above the wire,the magnitude of magnetic field will be different and their directions will be same to each other. (d) minimum at the surface of the wire. ∮B→.dl→ = μoiinsideAt surface, B×2πR = μoi⇒Bsurface = μoi2πRInside, B×2πr = μoi’ for r<RHere i, is the current enclosed by the amperian loop drawn inside the wire. Binside will be proportional to the distance from the axis. The magnetic fields from points on the cross section will point in opposite directions and will cancel each other at the centre. Outside, B×2πr = μoi⇒Boutside = μoi2πr, r>RTherefore, the magnitude of the magnetic field is maximum at the surface of the wire and minimum at the axis of the wire. (d) is zero just outside the tube. A hollow tube is carrying uniform electric current along its length, so the current enclosed inside the tube is zero. 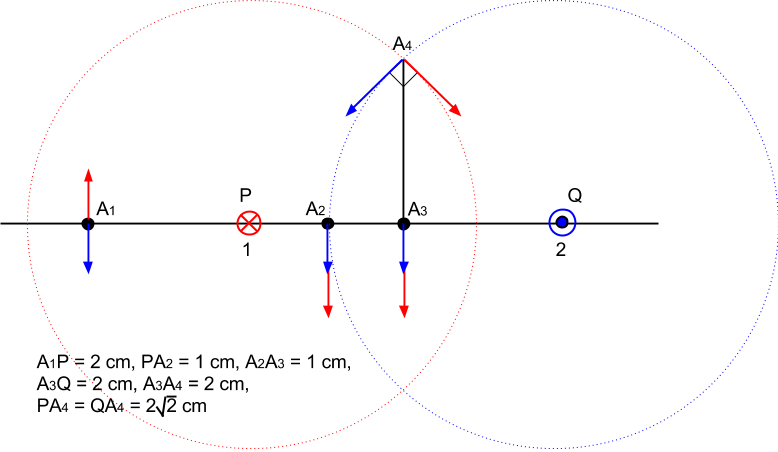 ∮B→.dl→ = μoiinsideInside the tube,∮B→.dl→ = 0, r<R⇒Binside = Constant⇒Baxis = 0The magnetic fields from points on the circular surface will point in opposite directions and cancel each other. (d) in between the tow conductors. According to Ampere’s law, in a coaxial, straight cable carrying currents i in the inner conductor and –i (equally in the opposite direction) in the outside conductor. ∮B→.dl→ = μo(i-i)⇒B = 0Therefore, the magnetic field is zero outside the cable. A steady electric current is flowing through a cylindrical conductor. (a) The electric field at the axis of the conductor is zero. (b) The magnetic field at the axis of the conductor is zero. (c) The electric field in the vicinity of the conductor is zero. (d) The magnetic field in the vicinity of the conductor is zero. As the current is flowing through a conductor so it it is distributed only on the surface of the conductor not in the volume of the cylindrical conductor. It is equivalent to charge distribution on a cylindrical sheet for which electric field inside a conducting cylindrical sheet is always zero. Magnetic fields at any point inside the conducting cylinder is proportional to the distance from the axis of the cylinder. At the axis, r = 0. This implies that field will be zero at the axis. F →=qv →×B → and B=μ0i2πr, show that the SI units of the magnetic field B and the permeability constant µ0 may be written as N mA−1 and NA−2 respectively. 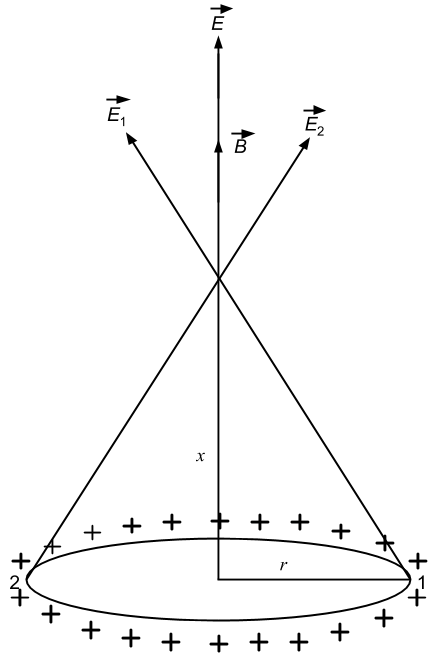 B →at the point (1 m, 0, 0). B →due to this current. A transmission wire carries a current of 100 A. What would be the magnetic field B at a point on the road if the wire is 8 m above the road? A long, straight wire carrying a current of 1.0 A is placed horizontally in a uniform magnetic field B = 1.0 × 10−5 T pointing vertically upward figure. Find the magnitude of the resultant magnetic field at the points P and Q, both situated at a distance of 2.0 cm from the wire in the same horizontal plane. A long, straight wire of radius r carries a current i and is placed horizontally in a uniform magnetic field B pointing vertically upward. The current is uniformly distributed over its cross section. (a) At what points will the resultant magnetic field have maximum magnitude? What will be the maximum magnitude? (b) What will be the minimum magnitude of the resultant magnetic field? (a) As the wire in question is carrying current, so it will also generate a magnetic field around it. And for a long straight wire it will be maximum at the mid-point called P.
A long, straight wire carrying a current of 30 A is placed in an external, uniform magnetic field of 4.0 × 10−4 T parallel to the current. Find the magnitude of the resultant magnetic field at a point 2.0 cm away from the wire. B0 is perpendicular to B (as shown in the figure). A long, vertical wire carrying a current of 10 A in the upward direction is placed in a region where a horizontal magnetic field of magnitude 2.0 × 10−3 T exists from south to north. Find the point where the resultant magnetic field is zero. To make the resultant magnetic field zero, the magnetic field due to the wire should be of the same magnitude as B0 and in the direction north to south. The above condition will be satisfied when the required point will be placed in the west w.r.t. the wire. Let the separation of the point from the wire be d.
B=μ0I2πdFrom the question, B = B0. Figure shows two parallel wires separated by a distance of 4.0 cm and carrying equal currents of 10 A along opposite directions. Find the magnitude of the magnetic field B at the points A1, A2, A3. Red and blue arrow denotes the direction of magnetic field due to the wire marked as red and blue respectively. P (marked red) denotes the wire carrying current in a plane going into the paper. Q (marked blue) denotes the wire carrying current in a plane coming out of the paper. ⇒B= 2×10-7×102×10-2-2×10-7×106×10-2 = 1-13×10-4 = 0.67×10-4 TSimilarly, we get the magnetic field at A2 using eq. (1). Two parallel wires carry equal currents of 10 A along the same direction and are separated by a distance of 2.0 cm. Find the magnetic field at a point which is 2.0 cm away from each of these wires. In the figure, dotted circle shows the magnetic field lines due to current carrying wire placed in a plane perpendicular to the plane of the paper. Two long, straight wires, each carrying a current of 5 A, are placed along the x– and y-axis respectively. The currents point along the positive directions of the axes. Find the magnetic fields at the points (a) (1 m, 1 m), (b) (−1 m, 1 m), (c) (−1 m, −1 m) and (d) (1 m, −1 m). (a) At point (1 m, 1 m), the magnetic fields due to the wires are the same in magnitude, but they are opposite in direction. Hence, the net magnetic field is zero. (b) At point (−1 m, 1 m), the magnetic fields due to the wires are in upward direction. (c) At point (−1 m, −1 m), the magnetic fields due to the wires are the same in magnitude, but they are opposite in direction. (d) At point (1 m, −1 m), the magnetic fields due to the wires are in upward direction. Four long, straight wires, each carrying a current of 5.0 A, are placed in a plane as shown in figure. The points of intersection form a square of side 5.0 cm. (a) Find the magnetic field at the centre P of the square. (b) Q1, Q2, Q3, and Q4, are points situated on the diagonals of the square and at a distance from P that is equal to the diagonal of the square. Find the magnetic fields at these points. Let the horizontal wires placed at the bottom and top are denoted as W1 and W2 respectively. Let the vertical wires placed at the right and left to point P are denoted as W3 and W4 respectively. Magnetic fields due to wires W1 and W2 are the same in magnitude, but they are opposite in direction. Magnetic fields due to wires W3 and W4 are the same in magnitude, but they are opposite in direction. Due to wire W1, separation of point Q1 from the wire (d) is 7.5 cm. Due to wire W2, separation of point Q1 from the wire (d) is 2.5 cm. Due to wire W3, separation of point Q1 from the wire (d) is 7.5 cm. Due to wire W4, separation of point Q1 from the wire (d) is 2.5 cm. Similarly, at point Q3, the magnetic field is 1.1 × 10−4 T (in downward direction) and at point Q4, the magnetic field is zero. Figure shows a long wire bent at the middle to form a right angle. Show that the magnitudes of the magnetic fields at the point P, Q, R and S are equal and find this magnitude. As shown in the figure, points P, Q, R and S lie on a circle of radius d.
Let the wires be named W1 and W2. Consider a straight piece of length x of a wire carrying a current i. Let P be a point on the perpendicular bisector of the piece, situated at a distance d from its middle point. Show that for d >> x, the magnetic field at P varies as 1/d2 whereas for d << x, it varies as 1/d. Let AB be the wire of length x with midpoint O. Consider a 10-cm long piece of a wire which carries a current of 10 A. Find the magnitude of the magnetic field due to the piece at a point which makes an equilateral triangle with the ends of the piece. Let AB be the wire of length 10 cm and P be the required point. A long, straight wire carries a current i. Let B1 be the magnetic field at a point P at a distance d from the wire. Consider a section of length l of this wire such that the point P lies on a perpendicular bisector of the section B2 be the magnetic field at this point due to this second only. Find the value of d/l so that B2 differs from B1 by 1%. 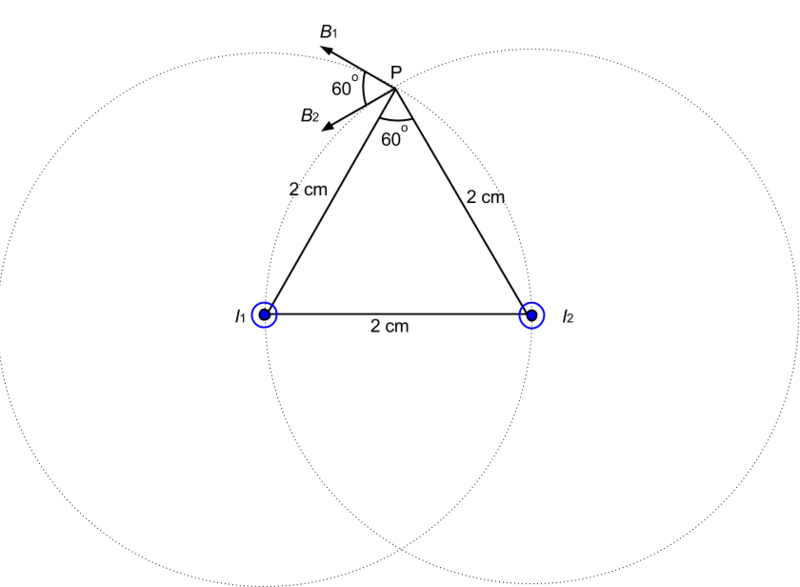 Figure shows a square loop ABCD with edge-length a. The resistance of the wire ABC is r and that of ADC is 2r. Find the magnetic field B at the centre of the loop assuming uniform wires. Let the currents in wires ABC and ADC be i1 and i2, respectively. The resistances in wires ABC and ADC are r and 2r, respectively. Figure shows a square loop of edge a made of a uniform wire. A current i enters the loop at the point A and leaves it at the point C. Find the magnetic field at the point P which is on the perpendicular bisector of AB at a distance a/4 from it. =μ0i2πaa2a22+a42+a2a22+3a42along⊗So, net magnetic field at point P.
Consider the situation described in the previous problem. Suppose the current i enters the loop at the points A and leaves it at the point B. Find the magnetic field at the centre of the loop. The loop ABCD can be considered as a circuit with two resistances in parallel, one along branch AB and other along branch ADC. As, the sides of the loop are identical, their resistances are also same. Let the resistance of each side be r.
Magnetic field due to wire AD, DC and CB will be into the plane of paper according to right hand thumb rule. Magnetic field due to wire AB will be out of the plane of paper according to right hand thumb rule. Net magnetic field at the centre = BAD +BDC +BCB − BAB which will be out of the plane of paper. The wire ABC shown in figure forms an equilateral triangle. Find the magnetic field B at the centre O of the triangle assuming the wire to be uniform. Let current 2I enter the circuit. Since the wire is uniform, the current will be equally divided at point A (as shown in the figure). A wire of length l is bent in the form of an equilateral triangle and carries an electric current i. (a) Find the magnetic field B at the centre. (b) If the wire is bent in the form of a square, what would be the value of B at the centre? Let ABC be the equilateral triangle with side l/3 and centre M.
Bnet = 3B =27μ0iπlIt is perpendicular to the plane in outward direction if the current is anticlockwise and perpendicular to the plane in inward direction if the current is clockwise. A long wire carrying a current i is bent to form a place along α. Find the magnetic field B at a point on the bisector of this angle situated at a distance x from the vertex. Let CAB be the wire making an angle α, P be the point on the bisector of this angle situated at a distance x from the vertex A and d be the perpendicular distance of AC and AB from P.
θ1 = 90-α2 and θ2=90°, respectively. Find the magnetic field B at the centre of a rectangular loop of length l and width b, carrying a current i. A regular polygon of n sides is formed by bending a wire of total length 2πr which carries a current i. (a) Find the magnetic filed B at the centre of the polygon. (b) By letting n → ∞, deduce the expression for the magnetic field at the centre of a circular current. Each of the batteries shown in figure has an emf equal to 5 V. Show that the magnetic field B at the point P is zero for any set of values of the resistances. By appluing Kirchoff voltagee law,we can see that the current in the circuit is zero. Field at point P is independent of the values of the resistances in the circuit. A straight, how wire carries a current of 20 A. Another wire carrying equal current is placed parallel to it. If the force acting on a length of 10 cm of the second wire is 2.0 × 10−5 N, what is the separation between them? Let the separation between the two wires be d.
Three coplanar parallel wires, each carrying a current of 10 A along the same direction, are placed with a separation 5.0 cm between the consecutive ones. Find the magnitude of the magnetic force per unit length acting on the wires. 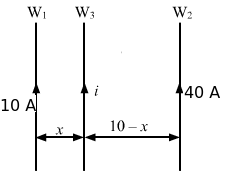 Let wires W1, W2 and W3 be arranged as shown in the figure. Two parallel wires separated by a distance of 10 cm carry currents of 10 A and 40 A along the same direction. Where should a third current by placed so that it experiences no magnetic force? Let the third wire W3 having current i in upward direction be placed x cm from the 10 A current wire. Fl = μ0i1i22πdAccording to the question, wire W3 experiences no magnetic force. ⇒μ010i2πx=μ040i2π(10-x)⇒10-x=4x⇒x=2 cmThus, wire W3 is placed 2 cm from the 10 A current wire. Figure shows a part of an electric circuit. The wires AB, CD and EF are long and have identical resistance. The separation between the neighbouring wires is 1.0 cm. The wires AE and BF have negligible resistance and the ammeter reads 30 A. Calculate the magnetic force per unit length of AB and CD. Since wires AB, CD and EF have identical resistance, the current (30 A) gets equally distributed in them, that is, 10 A in each wire. A long, straight wire is fixed horizontally and carries a current of 50.0 A. A second wire having linear mass density 1.0 × 10−4 kg m−1 is placed parallel to and directly above this wire at a separation of 5.0 mm. What current should this second wire carry such that the magnetic repulsion can balance its weight? Let i2 be the current in the second wire in opposite direction. A square loop PQRS carrying a current of 6.0 A is placed near a long wire carrying 10 A as shown in figure. (a) Show that the magnetic force acting on the part PQ is equal and opposite to the part RS. (b) Find the magnetic force on the square loop. Now, consider an element on PQ of width dx at a distance x from the wire. FPQ=μ0i1i22π∫13dxx =2×10-7×6×10[lnx]13 =120×10-7ln3 NSimilarly, FRS=μ0i1i22π∫31dxx =120×10-7ln 13 =-120×10-7ln3 NBoth forces are equal in magnitude, but they are opposite in direction. A circular loop of one turn carries a current of 5.00 A. If the magnetic field B at the centre is 0.200 mT, find the radius of the loop. Now, let the radius of the loop be r.
A current-carrying circular coil of 100 turns and radius 5.0 cm produces a magnetic field of 6.0 × 10−5 T at its centre. Find the value of the current. Now, let the magnitude of current be i. An electron makes 3 × 105 revolutions per second in a circle of radius 0.5 angstrom. Find the magnetic field B at the centre of the circle. A conducting circular loop of radius a is connected to two long, straight wires. The straight wires carry a current i as shown in figure. Find the magnetic field B at the centre of the loop. As the centre of the loop, that is, point O, lies on the same line of two long, straight wires, the magnetic field at O due to each straight wire is zero. Since wires ABC and ADC are identical, the current gets equally distributed in two parts at point A. So, the magnetic field due to ABC and ADC at O are equal in magnitude but are opposite in directions. (as shown in the figure). Two circular coils of radii 5.0 cm and 10 cm carry equal currents of 2.0 A. The coils have 50 and 100 turns respectively and are placed in such a way that their planes as well as the centres coincide. Find the magnitude of the magnetic field B at the common centre of the coils if the currents in the coils are (a) in the same sense (b) in the opposite sense. In this case, magnetic fields due to C1 and C2 at the centre are along the same direction. Bnet = B1+B2= (4π×10-4)+(4π×10-4)= 8π×10-4 T= 25.12 mT(b) When the direction of current in the two coils is opposite to each other then the magnetic fields will also point in opposite directions as shown in the figure. Hence, the net magnetic field will be obtained by the subtraction of the two magnetic fields. A circular loop of radius 20 cm carries a current of 10 A. An electron crosses the plane of the loop with a speed of 2.0 × 106 m s−1. The direction of motion makes an angle of 30° with the axis of the circle and passes through its centre. Find the magnitude of the magnetic force on the electron at the instant it crosses the plane. A circular loop of radius R carries a current I. Another circular loop of radius r(<<R) carries a current i and is placed at the centre of the larger loop. The planes of the two circles are at right angle to each other. Find the torque acting on the smaller loop. B=μ0I2RLet A be the area of the smaller loop and let current i pass through it. A circular loop of radius r carrying a current i is held at the centre of another circular loop of radius R(>>r) carrying a current I. The plane of the smaller loop makes an angle of 30° with that of the larger loop. If the smaller loop is held fixed in this position by applying a single force at a point on its periphery, what would be the minimum magnitude of this force? B = μ0I2RLet A be the area of the smaller loop and let current i pass through it. ⇒Fr = μ0πr2Ii4R⇒F = μ0πIir4RThis is the minimum magnitude of force to balance the given condition. Find the magnetic field B due to a semicircular wire of radius 10.0 cm carrying a current of 5.0 A at its centre of curvature. A piece of wire carrying a current of 6.00 A is bent in the form of a circular are of radius 10.0 cm, and it subtends an angle of 120° at the centre. Find the magnetic field B due to this piece of wire at the centre. A circular loop of radius r carries a current i. How should a long, straight wire carrying a current 4i be placed in the plane of the circle so that the magnetic field at the centre becomes zero? B l = μ0i2rLet a straight wire carrying 4i current be placed at a distance x from the centre such that the magnetic fields of the loop and the wire are of equal magnitude but in opposite direction at O. 4rπfrom the centre of the loop (as shown in the figure). B →at the centre of the coil. (b) At what distance from the centre along the axis of the coil will the field B drop to half its value at the centre? (a) Let the magnetic field at the centre of the coil is B.
BP = nμ0ir22(x2+r2)32Where x is the distance of the point from the centre of the coil. 12Bcentre = BP⇒12nμ0i2r = nμ0ir22(x2+r2)32⇒(x2+r2)32 = 2r3⇒(x2+r2) = 41/3r2⇒x2 + r2 = 1.58r2⇒x =0.766 r⇒x = ±7.66 cmMagnetic field will drop to half of its value at the centre if the distance of that point from the centre of the coil along the axis of coil is equal to 7.66 cm. A circular loop of radius 4.0 cm is placed in a horizontal plane and carries an electric current of 5.0 A in the clockwise direction as seen from above. Find the magnetic field (a) at a point 3.0 cm above the centre of the loop (b) at a point 3.0 cm below the centre of the loop. A charge of 3.14 × 10−6 C is distributed uniformly over a circular ring of radius 20.0 cm. The ring rotates about its axis with an angular velocity of 60.0 rad s−1. Find the ratio of the electric field to the magnetic field at a point on the axis at a distance of 5.00 cm from the centre. ∴Current, i = qt = 3.14×10-6×602π=30×10-6 AIn the figure, E1 and E2 denotes the electric field at a point on the axis at a distance of 5.00 cm from the centre due to small element 1 and 2 of the ring respectively. E is the resultant electric field due to the entire ring at a point on the axis at a distance of 5.00 cm from the centre. A thin but long, hollow, cylindrical tube of radius r carries i along its length. Find the magnitude of the magnetic field at a distance r/2 from the surface (a) inside the tube (b) outside the tube. (a) The magnetic field inside any conducting tube is always zero. r+r2=3r2Consider an Amperian loop, as shown in the figure. A long, cylindrical tube of inner and outer radii a and b carries a current i distributed uniformly over its cross section. Find the magnitude of the magnitude filed at a point (a) just inside the tube (b) just outside the tube. a) The magnetic field inside any conducting tube is always zero. ∴ Magnetic field just inside the tube is zero. (b) Let the point outside the tube with distance b be P.
Consider an Amperian loop, as shown in the figure. A long, cylindrical wire of radius b carries a current i distributed uniformly over its cross section. Find the magnitude of the magnetic field at a point inside the wire at a distance a from the axis. A solid wire of radius 10 cm carries a current of 5.0 A distributed uniformly over its cross section. Find the magnetic field B at a point at a distance (a) 2 cm (b) 10 cm and (c) 20 cm away from the axis. Sketch a graph B versus x for 0 < x < 20 cm. Sometimes we show an idealised magnetic field which is uniform in a given region and falls to zero abruptly. One such field is represented in figure. Using Ampere’s law over the path PQRS, show that such a field is not possible. Half of the loop PQRS is in the region of magnetic field and half in the area of zero magnetic field. Let us consider a current carrying circular wire, due to which there is uniform magnetic field in the region. ∫B.dl=μ0iIf there is current enclosed by the loop PQRS, then magnetic field B cannot be 0. Whereas, we have taken the magnetic field at point A to be zero. Thus, such a field is not possible. Two large metal sheets carry currents as shown in figure. The current through a strip of width dl is Kdl where K is a constant. Find the magnetic field at the points P, Q and R.
Consider the situation of the previous problem. A particle having charge q and mass m is projected from the point Q in a direction going into the plane of the diagram. It is found to describe a circle of radius r between the two plates. Find the speed of the charged particle. The magnetic field B inside a long solenoid, carrying a current of 5.00 A, is 3.14 × 10−2 T. Find the number of turns per unit length of the solenoid. A long solenoid is fabricated by closely winding a wire of radius 0.5 mm over a cylindrical nonmagnetic frame so that the successive turns nearly touch each other. What would be the magnetic field B at the centre of the solenoid if it carries a current of 5 A? A copper wire having resistance 0.01 ohm in each metre is used to wind a 400-turn solenoid of radius 1.0 cm and length 20 cm. Find the emf of a battery which when connected across the solenoid will cause a magnetic field of 1.0 × 10−2 T near the centre of the solenoid. Let E be the emf of the battery and R0 be the total resistance of the wire. A tightly-wound, long solenoid carries a current of 2.00 A. An electron is found to execute a uniform circular motion inside the solenoid with a frequency of 1.00 × 108 rev s−1. Find the number of turns per metre in the solenoid. A tightly-wound, long solenoid has n turns per unit length, a radius r and carries a current i. A particle having charge q and mass m is projected from a point on the axis in a direction perpendicular to the axis. What can be the maximum speed for which the particle does not strike the solenoid? When a particle is projected perpendicular to the magnetic field, it describes a circular path. And for the particle (projected from a point on the axis in a direction perpendicular to the axis) to not strike the solenoid, the maximum radius of that circular path should be r/2. A tightly-wound, long solenoid is kept with its axis parallel to a large metal sheet carrying a surface current. The surface current through a width dl of the sheet is Kdl and the number of turns per unit length of the solenoid is n. The magnetic field near the centre of the solenoid is found to be zero. (a) Find the current in the solenoid. (b) If the solenoid is rotated to make its axis perpendicular to the metal sheet, what would be the magnitude of the magnetic field near its centre? B →plate and B →solenoidare perpendicular to each other. A capacitor of capacitance 100 µF is connected to a battery of 20 volts for a long time and then disconnected from it. It is now connected across a long solenoid having 4000 turns per metre. It is found that the potential difference across the capacitor drops to 90% of its maximum value in 2.0 seconds. Estimate the average magnetic field produced at the centre of the solenoid during this period. = 100×10-6×20= 2×10-3 CIt is given that the potential difference across the capacitor drops to 90% of its maximum value.